We have reached the state quarterfinals in the 11-Man classes of Kansas high school football, and the 8-Man classes will play the semifinals this week. Kpreps will continue to post state rankings throughout the playoffs culminating in our final poll after the state champions are crowned. Let’s take a look at the Kpreps.com rankings for November 11th powered by Pinamonti Physical Therapy. The only changes in the Class 6A poll occurred towards the bottom of the top 5 as both Gardner-Edgerton and Blue Valley Northwest fell from the rankings with losses to Olathe North and Olathe E ast, respectivel y. As a result, the two Sunflower Le ague schools replace the Eastern Kansas League schools with Olathe North taking over at No. 4 and Olathe East at No. 5. Derby , Lawrence Free State, and Shawnee Mission East remain in the top three spots meaning the Sunflower League has four ranked teams in Class 6A. In Class 5A, the top five remain intact heading into the second round of the playoffs but some big games await this week. Top-ranked Bishop Carroll will host No. 3 Salina South in a rematch of the 5A state semifinal from a year ago, while No. 2 Bishop Miege hosts No. 4 Blue Valley West in the quarterfinals for the second consecutive season. Mill Valley remains at No. 5 this week after a dominating 38-6 win over St. Thomas Aquinas in the first round. The Jaguars will face a stiff test traveling to Blue Valley this week. Speaking of big games, Holton will host Andale this week in a clash of Class 4A’s top-ranked teams. 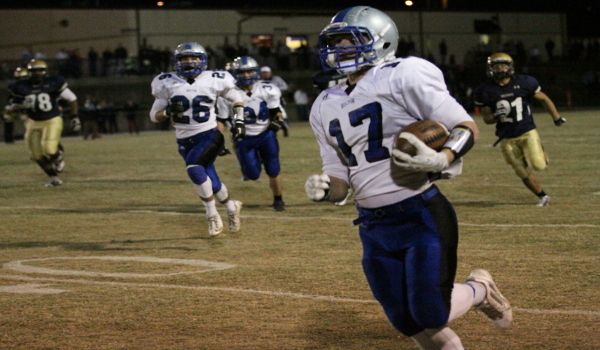 Holton posted wins over Hesston (45-0) and Mulvane (35-14) this week, while No. 2 Andale shutout Larned (60-0) and beat McPherson (36-7). Baldwin remains the favorite on the eastern side of the 4A bracket despite a couple of close wins this week. The Bulldogs defeated St. James Academy 19-0 in the first round, and won at Tonganoxie 28-10 on Saturday. Buhler remains at No. 4 after winning a 14-7 battle at Ulysses on Tuesday and then blowing out Abilene in the second round. Paola eliminated two SEK League schools in Fort Scott and Independence to remain at No. 5. After two playoff rounds in Class 3A, only Caney Valley fell from the rankings after a 30-22 first-round loss to St. Mary’s Colgan in the rain and mud on Tuesday night. Defending champion Scott City replaces the Bullpups at No. 5 after a solid 24-21 win at Phillipsburg on Saturday. Top-ranked Beloit has cruised to the quarterfinals with wins over Southeast of Saline and Holcomb. Conway Springs remains at No. 2 with a tough date with Scott City this week, while No. 3 Rossville will be favored to improve to 12-0 with a win at Cherryvale. Silver Lake remains ranked fourth and will travel to St. Mary’s Colgan this week. The Class 2-1A poll remains unchanged this week, but No. 5 Lyndon survived a legitimate scare against Northern Heights in the first round. The Tigers held on for a 49-44 win in a game that featured six lead changes. Lyndon had defeated those same Wildcats 36-0 in the final week of the regular season. This week’s schedule will be quite a bit more telling as No. 4 Oakley hosts No. 2 La Crosse, and No. 3 Meade host a Smith Center team that may be playing as well as anyone in the class. Several changes highlight the 8-Man, Division I poll and there are still likely several more to come. Osborne remains atop the rankings after an impressive week in eliminating Madison 40-34 and Marais des Cygnes Valley 68-52. Despite the losses, Madison and Marais des Cygnes Valley remain in the top five at No. 4 and No. 5, respectively. Hoxie moves into the No. 2 spot this week after handling last week’s No. 2 team Kiowa County, 38-8. The Indians will have another tough test this week when they travel to No. 3 Hodgeman County. The Longhorns remained unbeaten with a 34-32 win over Atwood-Rawlins County and a 44-36 win over Central Plains. Finally, the 8-Man, Division II quarterfinals are set with a familiar rivalry highlighting this week’s bill. Top-ranked Baileyville B&B will meet No. 3 Hanover for the final time in their storied rivalry. The Falcons cruised into the semifinals with 50-0 wins over Southern Cloud and Waverly. Hanover has been equally impressive by beating Hope 52-0 and South Barber 60-6. B&B defeated Hanover 34-22 during the regular season. Sharon Springs-Wallace County will host No. 4 Beloit St. John’s-Tipton in the other semifinal. The Wildcats beat Dighton for a second time this season, while the Blujays edged an injury-depleted Victoria team 22-16.